BigTime Electronics introduces Twisters Headphones. Wireless Bluetooth headphones that turn into Wireless Bluetooth Speakers. Minooka, IL, November 18, 2015	(Newswire.com) - Twisters Headphones invites you to TWIST, SHOUT, AND LET IT ALL OUT! If you have never heard of Twisters Headphones, these are a very unique headphone. Not only do they go on your ears, but they twist out and become a high quality Bluetooth Speaker. Click here for sample video. 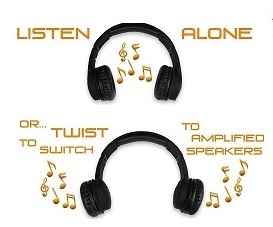 The Twisters Headphones are literally a 2 in 1 deal that work exactly how they say they do. When you think about it, this concept kind of eliminates the need for having a dedicated Bluetooth speaker. As far as sound quality goes if you like bass, these are definitely for you! They are booming when they are on your head, but the real fun doesn’t begin until you twist the headphones into Bluetooth speaker mode. The sound becomes absurdly loud, and sounds almost 10 times better then when in headphone mode. As far as the design of the Twisters go, they really do look tough; they aren't your sleek looking Beats or clean cut Noontech headphones. They really have a sense of heft to them, and come with a 2 year warranty. So, if you want something that is big and unique, these headphones are worth a try. H At this price point 59.95 , they make the perfect holiday gift for anyone. On one of the ear cups, you will find all of your audio controls and even a microphone for making phone calls. The Twisters Headphones have literally thought of it all. They have created a pair of superb, quality headphones with multi-functions for under $60.00. However where the Twisters excel, over any other headphone on the market, is their battery life. 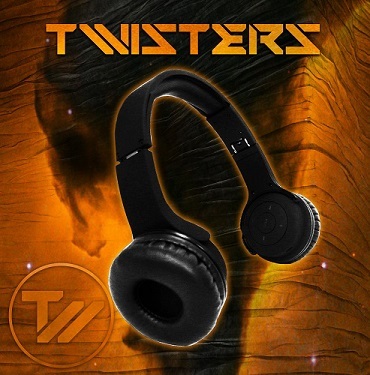 Twisters Headphones provide an 18 hour long battery life, which after testing holds true. The battery life on the Bluetooth mode is simply tremendous. 6 hours in speaker mode and 18 hours in headphone mode. When it comes to headphones, these headphones are at the top of their game; however, the Bluetooth speaker mode is what makes these so special. Overall, the Twisters are making a name for themselves for versatility, whether you want to use them for standard headphones or Bluetooth speaker mode, for only $59.95 you can't beat it! They are the most versatile headphones that you will ever buy. The Twisters Headphones are incredibly unique and a steal of a deal! BigTime Battery and Electronics is a leading developer and distributor of batteries and electronics. With over 90 years experience in introducing batteries and electronics innovations. A powerful and affordable Marine Deep Cycle Battery, BCI Group 31. PowerStar Brand AGM batteries celebrates 10 years since its introduction to the market in 2008.